Introducing new aquarium fish into your established tropical fish tank is one of the riskiest things you can do as a fish keeper. It can upset the aquarium ecosystem, cause conflict between fish, and even introduce disease organisms. It's a time when you need to take great care - and yet, by following a few basic rules, you can make it much safer. Although it can be tempting to introduce new fish immediately when established ones die, it's important to do so only when you are sure your aquarium ecosystem is stable and disease free. You should try to pick a time when your fish are stress free - except, of course, for stress which can be caused by a shoal being too small. But your aquarium isn't the only thing you should be concerned about. In order to make sure that your new fish enter the tank in good health and ready to deal with any social difficulties, you need to make the transition as easy as possible for them. It should go without saying that, when selecting new tropical fish, you should choose only the healthiest specimens. As a rule, look for bright colours and pert fins and avoid fish with wounds or tatters. 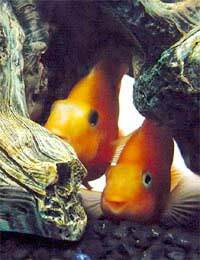 Nevertheless, it is always a good idea to treat new fish at home before you add them to your main aquarium. New fish should spend two weeks in your isolation tank. As most new aquarium fish will previously have lived in crowded conditions, this can be quite stressful for them, so give them some plants to hide behind. Low stress means healthier fish. Whilst your new fish are in isolation, you should treat them with a general purpose antibiotic and anti-parasite preparation. Paraguard is particularly good, as it also helps fish to build up a healthy protective coating of natural mucus. Whatever you use, make sure you complete the course before transferring fish to the main aquarium, even if they look well. Another advantage of isolation is that it will give your new fish time to adjust to the foods you use, which may be unfamiliar to them. This can be difficult to do in the busy, aggressive environment of feeding time in the main aquarium. Even the most gregarious fish are wary of strangers, so the arrival of new aquarium fish can be stressful for those already there. There are several things you can do to reduce the risk of unpleasant confrontation. Let them know what's coming - Place your isolation tank next to your main aquarium so that the fish can see each other and get used to each other before they meet directly. Disrupt their territory - Move a few rocks and plants around so that the established fish are less sure of themselves and of their ownership of their environment. Move females first - New females are almost always more welcome, so if you have a group of fish to introduce let the males wait till last when they'll seem less significant. Provide an extra meal - Surprise food just after new fish have been introduced will distract the established fish - but don't introduce fish close to established mealtimes, when tensions are high. Whenever you add new fish to your aquarium, it's important to increase the frequency of your water tests to make sure that you can maintain a healthy nitrogen cycle. Introduce fish only in small numbers to avoid making too drastic an impression on this. You can reduce the risk of pollution problems by treating the entire tank with a compound like Big Fish Fresh Start, which will also have a stabilising effect on fish health. Naturally, with more fish, you'll need to feed more, but try to scale this up gradually to avoid overfeeding. The key to successfully introducing new aquarium fish is patience. Don't rush through the process, no matter how excited you are, and remember that it's important to be diligent about tests and observation after the introduction has been made. Then you can settle back and enjoy your new fish and all the pleasure they bring.